Learn how to make savory little ham appetizer recipes by adding cheese or other ingredients. These can be served on bread, crackers, pastry dough or tortillas; the choices are endless. Anything is possible as long as they can be picked up with the fingers without too much mess. These will fit into most parties themes without too much expense. The flavor is always good regardless of the other added ingredients. I mentioned economical because just with a half of ham, hundreds (depending on other added ingredients) of ham appetizers can be made. Considering the variety of ingredients which blend well with ham, many different ham appetizers can be made with your guests not realizing they all include ham. Although most recipes are savory and I do love those, many great ones are made with ingredients like pineapple, raisins and other fruits. A favorite of mine is simply mixing finely chopped ham and finely chopped pineapple with cream cheese; after adding a little milk to get a spreading consistency, it is ready to go on crackers and serve. So easy and delicious too! I learned how to make ham appetizer recipes for New Years Eve and New Years Day. After cooking a large ham usually for Christmas there is always a lot of leftovers. What a great way to use some of this leftover ham. Not only is it great in seasoning casseroles and other dishes it makes great flavor in a cheese ball recipe, ham spread, a quesadilla recipe and other ham appetizer recipes. The following ham quesadillas recipe is deliciously flavored with herbed cream cheese, Gouda cheese and sun dried tomatoes. 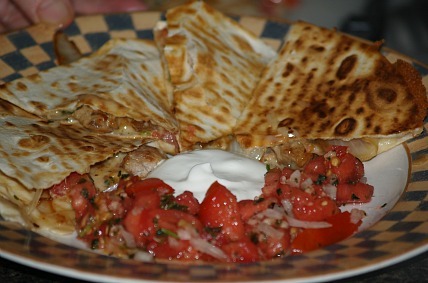 Spread cream cheese over 2 of the tortillas; layer with ham, tomatoes, Gouda cheese and parsley. Heat 1 tablespoon oil in large non stick skillet over medium heat. Add quesadilla, brush top with oil; cook 2 to 3 minutes on each side or until golden brown and cheese has melted. Remove quesadilla from skillet and keep warm until other quesadilla has been prepared. Cut each quesadilla into 8 wedges and serve immediately. 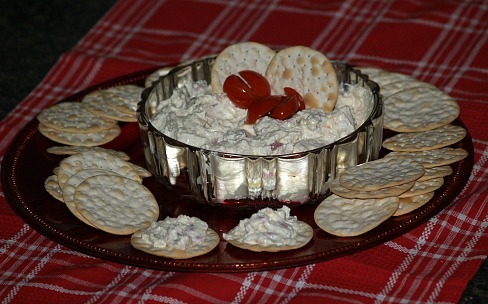 Learn how to make other ham appetizer recipes include one like this ham spread recipe. Many similar ones can be made simply by varying the ingredients a little like using different cheeses. Stir together in a small mixing bowl the cream cheese, mustard and mayonnaise. Stir in ham and Cheddar cheese; cover and chill. Divide ham into half; mix ham and remaining ingredients together and roll into a ball. Press other half of ham around the ball covering entire surface of the ball; chill. Add these ham and cheese squares to your ham appetizers for the holidays. They are deliciously flavored with horseradish. Combine and blend cream cheese, horseradish, mayonnaise, Worcestershire sauce, garlic and pepper. Place a slice of ham on wax paper, spread cheese spread over the ham and then top with another piece of ham. Repeat with another layer of spread and ending with a slice of ham. Wrap securely in wax paper and place in freezer for 2 hours. One hour before serving remove from freezer and cut into small squares or cubes. This is one of the fast and easy ham appetizer recipes. If you haven’t cooked a ham you can use a can of Hormel ham. Combine all ingredients and blend well; chill. Combine and mix all ingredients; shape into 1 inch balls. Place on ungreased baking sheets; flatten with a fork dipped in flour. Cover with wax paper and chill 1 hour. There are meatball recipe for everything so why not ham appetizer recipe for the holidays. Combine and mix all ingredients; shape into small balls size of marbles. Roll in egg and then crumbs; fry in deep hot fat about 30 seconds. Insert a toothpick in each ball; serve with spicy hot cocktail sauce.